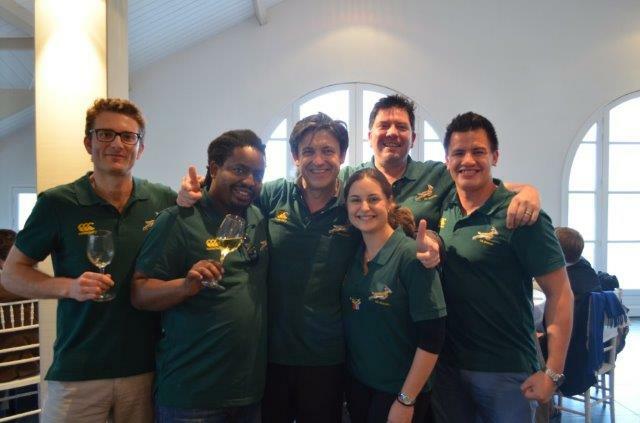 While China dethrone Spain as World Champion, Team South Africa 2016 achieved a prestigious 6th position at the Wine Tasting World Championship organized by La Revue du Vin de France in Provence. The 4th Wine Tasting World Championship saw 21 countries competing for the ultimate title, and the Chinese victory sent a shock-wave in the wine tasting community, with the USA achieving bronze for their second participation. It is clearly a new trend in this competition usually dominated by European countries. Team South Africa 2016, lead by Anita Streicher Nel in the role of Captain, is comprised by Heidi Kritzinger, Stephanie Wiid and Dean Ehrlich. The 6th position they achieved is the best ever for Team South African, enabling them to defeat the world title owner, Spain, and the majority of the other prominent wine producing countries. 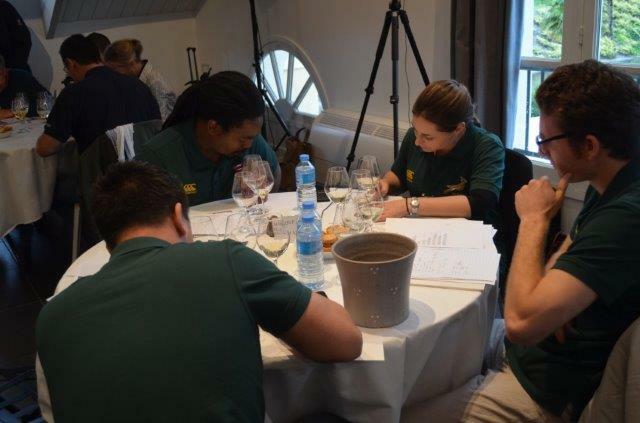 The competition made team South Africa identify some of the 12 wines that were served to Streicher’s team-mates, using just their palate memories to identify the cultivar, country, appellation, vintage and producer of the wines. Team South Africa 2016 was selected out of the winners of the South African Wine Tasting Championships. This yearly competition aims at giving all wine lovers the opportunity to show their talents and the best of them fly to the world championship. 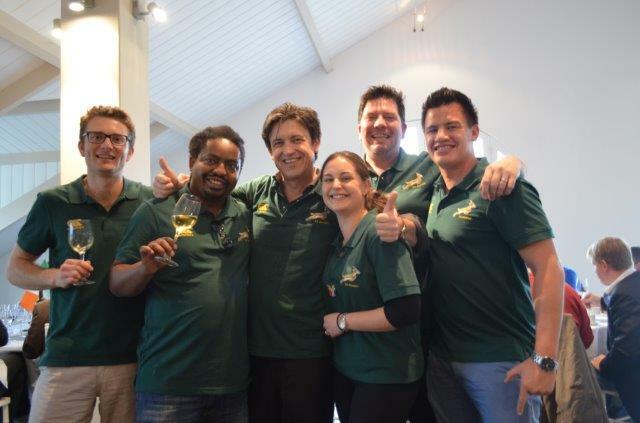 Team South Africa 2016 was coached by Sommelier Jean-Vincent Ridon and received the support of Dominique Laporte, Best Sommelier of France, to train before the competition. Anita declares: "I want to thank each and every one for the support during the preparation and practice in the run-up to the championship; we have been greatly inspired by so many people on our journey. Although it was a very tough contest this year, each member of the team brought their invaluable skill and experience to the table which I believe secured us the 6th world ranking." For its third qualification to this global challenge, Team South Africa achieved its best score ever at the international event. Lead by Ralph Reynolds, sommelier at Karibu, team 2015 is comprised of Veronica Plaatjies from Mosaic Restaurant, Tongai Joseph Dhafana from La Colombe and Anita Streicher-Nel from Morgenhof. The World Blind Tasting Challenge, organised by Revue du Vin de France, was held in Chateauneuf du Pape on Saturday 17th Oct, challenging 20 national teams to identify 12 wines from 8 different wine producing countries. With 98 points, Team South Africa secured a 12th position in the world ranking, its best achievement since their first participation to the event. Jean Vincent Ridon, the team coach is impressed by the achievement of Team 2015 considering the limited access to international wines in South Africa. Identifying wines such as the Croatian Malvasia or the Greek Assyrtiko proved to be impossible for our national champions. 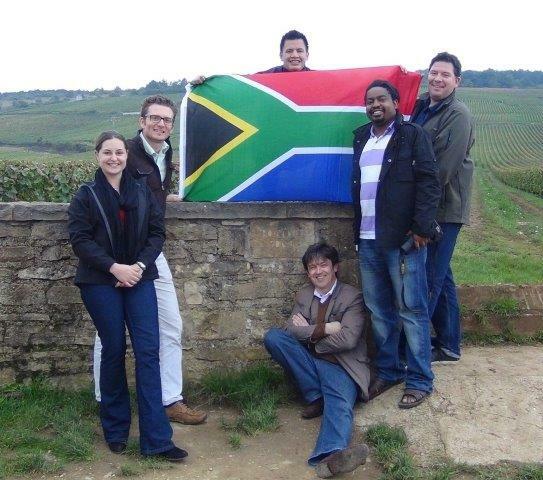 The 2015 Team South Africa members felt part of the global wine tribe, creating special friendships with the best wine tasters of the world. They are looking forward participating again to this international to fly our National colours. Spain was crowned world champion 2015, a great success after having come last in 2013. It gives hope to the South African Team - that with hard work, everything is possible. The team is proudly sponsored by Spiedel, Restaurant Mosaic, wine.co.za, Air France and Champagne Jacquart. 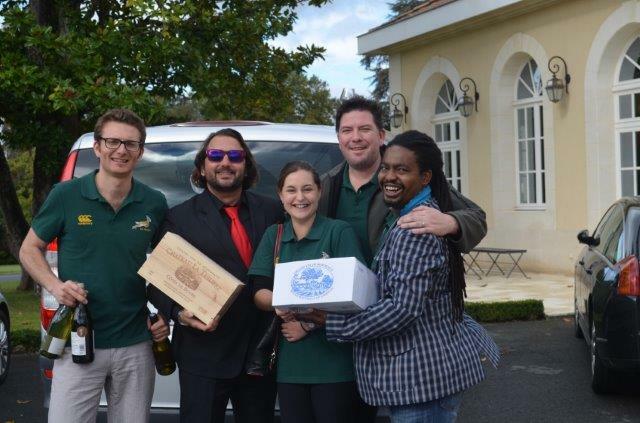 Team South Africa 2015 will hope to qualify again for the next year's World Blind Tasting Challenge that will be held in Burgundy in 2016. The South African Wine Tasting Championship will start selecting the candidates for the next magic team during 2016, so get your taste buds ready! Spain (140 points) , Belgium, Sweden, Andorra, France(105 points), Russia, UK, Poland, Portugal, Quebec, Finland, South Africa(98 points), China, Argentina, Luxemburg, Italy, Japan, Monaco, Switzerland, USA. TEAM MOSAIC 2014 AT THE WORLD CHAMPIONSHIP! Such an adventure! Samarie Smith, Gavin Whittaker (Captain), Chris Groenewald and Ralph Reynolds in action. The 2013 World Blind Wine Tasting Championships took place on the Saturday the 12th of October at Chateau Larrivet Haut-Brion, next to Bordeaux in FRANCE. 16 countries competed to win the title held by Denmark in 2012. Organised by “La Revue du Vin de France”; the oldest wine magazine in the world (founded in 1927); the World Wine Tasting Championship saw the first participation of a South African Team, from the national selections made at the South African Wine Tasting Championships 2013. 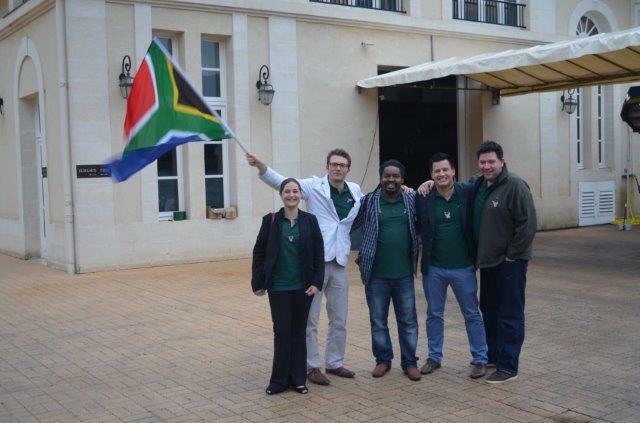 A team of five South-Africans, led by their coach, has been touring France for a full week, exploring diverse terroirs, improving their knowledge, and getting ready for the World event. 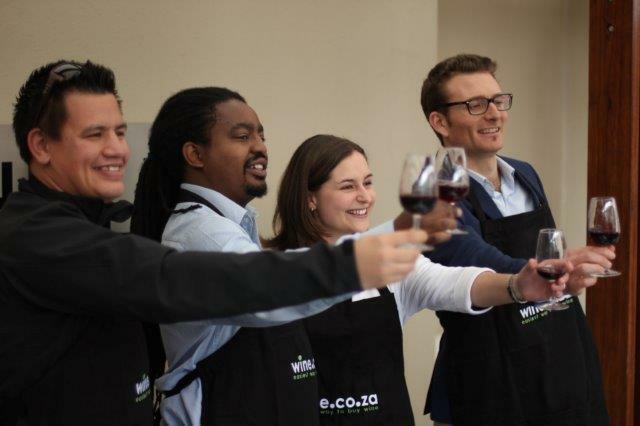 Chantelle Swanepoel, Gavin Whittaker, Khuselo Mputa, Roland Peens and Anton Swarts had to recognise 12 wines, selected from 9 countries, and served blind over a period of 2 hours. They had to find the main variety, the country of origin, the vintage, the region and the wine producer. A very difficult game when wines can be as diverse as 1998 Chateauneuf to Pape Rayas or 2010 Californian Roussane from Bonny Doon. A road movie about this adventure will be released early in 2014, showing how Team South African bonded together, exploring the diversity of French terroirs and discovering the French lifestyle, interacting with local producers, showing that wine is a common language to all hedonists around the world, whatever community they originate from.